Welcome to Albert Terrace Apartments! Located just steps from the beautiful downtown Sault St. Marie, where you will find plentiful shopping centres and delicious dining options to enjoy. This professionally managed 7-storey building boasts spacious one, and two-bedroom units with scenic patios, balconies and in-suite storage accessibility. Residents take advantage of our money-saving upgrades such as energy-efficient lighting and water-saving toilets. Situated in the heart of Sault Ste. 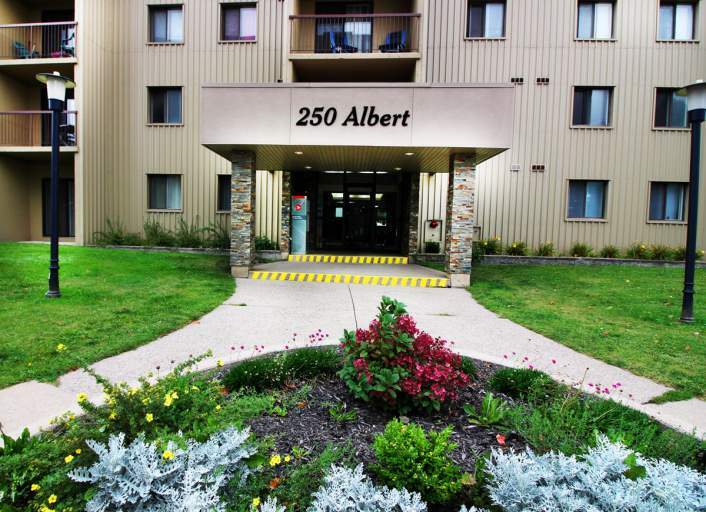 Marie, Albert Terrace Apartments is conveniently located within walking distance to a number of popular amenities, such as the Essar Centre and the Canadian-US Border, for those who travel often. Catch the latest movie at Galaxy Cinemas, or enjoy a night of entertainment at OLG Casino. Enjoy the Northern oasis of Sault Ste. Marie at Albert Terrace Apartments, a community that offers its residents contemporary living spaces in a welcoming environment.